Manchester United will not name their new manager this week. Netherlands coach Louis van Gaal is odds-on favourite but refused to answer questions at his country's pre-World Cup training camp on Wednesday. It was anticipated United would reveal the identity of David Moyes's successor after Tuesday's 3-1 win over Hull. However, BBC Sport has learned the news is unlikely to be revealed before United's final Premier League game at Southampton on Sunday. 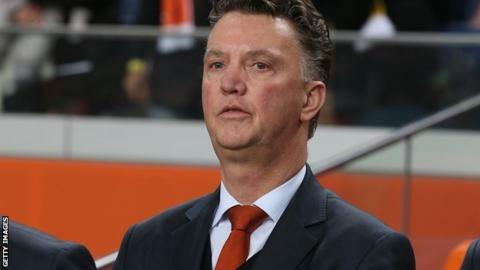 Dutch national team boss Van Gaal is leaving his role after Brazil 2014, but would not reply to a question about his future from BBC Sport's chief sports news correspondent Dan Roan in the Netherlands. Van Gaal's side begin their preparations this week, with domestic players meeting at a secluded hotel near the small Dutch town of Hoenderloo for the start of a three-day get-together. The former Ajax, Barcelona and Bayern Munich boss is scheduled to hold a news conference on Tuesday next week, by which time more should be known about his future beyond this summer. The Netherlands have friendlies against Ecuador, Ghana and Wales in the coming weeks before heading to Brazil for the World Cup, and Van Gaal will be eager to avoid distractions. Meanwhile, it is understood Giggs will meet with United's executive vice-chairman Ed Woodward on Friday for discussions about his future role. Louis van Gaal is the right man. But United should keep Ryan Giggs as number two. Then Giggs can come after Van Gaal. Contrary to speculation, the 40-year-old has yet to accept any coaching position with the Old Trafford outfit. Indeed, Giggs's entire future remains unknown. After introducing himself as a second-half substitute against Hull, when he set up United's third goal for Robin van Persie, he revealed it was still to be decided whether he would extend his playing career by another year. Giggs has already ruled out the possibility of playing for another club, meaning his 963rd appearance for his only professional club could turn out to be his last. And he is not on his own in waiting to discover if he has a future at United. Giggs and defenders Rio Ferdinand and Patrice Evra are yet to be offered contract extensions. "I am pretty relaxed," said Giggs. "I expect it is the same with Rio and Patrice. It is not as if they are young players. If they carry on, they carry on, if they leave, they leave. "New players are going to come in anyway so I think it will get sorted for the three of us in the next couple of weeks." Evidently it will be summer of change at Old Trafford, as United look to recover from their worst league campaign in 24 years. Yet Van Persie, who has a close relationship with Van Gaal and was recently spotted at a Dutch league game sat alongside his international manager, is adamant the alarming dip in fortune will be temporary. "Trust me we will be back," he told MUTV. "Trust me. Save this interview."